From the center of our Milky Way Galaxy in Sagittarius through the constellations of Scorpius and Ophiuchus, this southern field of view contains an assemblage of some of the most colorful nebulae in the sky. 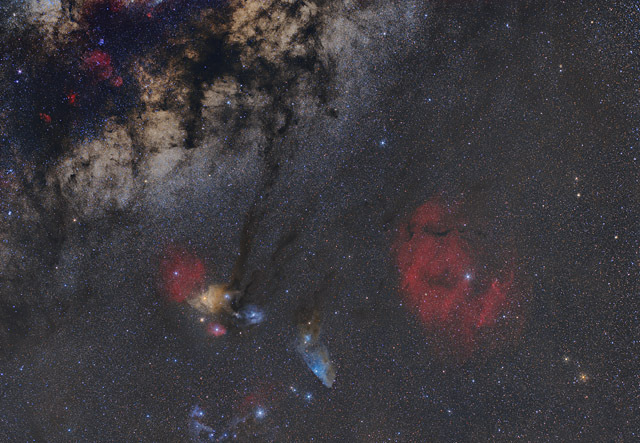 This beautiful area contains such notables as the Rho Ophiuchi Nebula and the Dark River, the reflection nebula vdB 99, the Cat's Paw Nebula, and the Blue Horsehead Nebula. Also highlighted on the right side of this image is the very faint emission nebula, Sh2-27. This nebula occupies a swath of sky of over 10 by 13 degrees. That's an area larger than 600 full Moons! To help visualize the collection of nebulae, try taking a peak at the annotated version of this image. Software Used Images Plus 5.75 for camera control, calibration, stacking, digital development, star shrinking and halo reduction, smoothing and noise reduction, and feature mask. Photoshop CS5 used for levels and curves, high pass filter, star shrinking, screen mask invert, lab color, vibrance, saturation adjustments, selective color, and match color. HLVG for additional color correction, Gradient Xterminator for gradient removal. Carboni Tools for additional noise reduction, and smoothing. Focus Magic for focus restoration. Registar for aligning stacks. Notes I had captured part of this section of sky last year with my 25 degrees of the Rho Ophiuchi Cloud Complex image. With the acquisition of my Canon 6D, I realized that the wider field of this camera could capture a very impressive field if rotated 90 degrees to the prior image. I'm quite happy with the final result, as there is such an interesting range of objects in this astrophoto. This image was published by Astronomy Magazine as its Picture of the Day for December 1, 2016!